In 1914, the First World War broke out. For the next four years fighting raged across Europe, the Middle East, Africa, and Asia. On 8 January 1918, United States President Woodrow Wilson issued a statement that became known as the Fourteen Points. In part, this speech called for Germany to withdraw from the territory it had occupied and for the formation of a League of Nations. During the fourth quarter of 1918, the Central Powers began to collapse. In particular, the German military was decisively defeated on the Western Front and the German navy mutinied, prompting domestic uprisings that became known as the German Revolution. Most of the war's major battles occurred in France and the French countryside was heavily scarred in the fighting. Furthermore, in 1918 during the German retreat, German troops devastated France's most industrialized region in the north-east (Nord-Pas de Calais Mining Basin). Extensive looting took place as German forces removed whatever material they could use and destroyed the rest. Hundreds of mines were destroyed along with railways, bridges, and entire villages. Prime Minister of France Georges Clemenceau was determined, for these reasons, that any just peace required Germany to pay reparations for the damage it had caused. Clemenceau viewed reparations as a way of weakening Germany to ensure it could never threaten France again. Reparations would also go towards the reconstruction costs in other countries, including Belgium, which was also directly affected by the war. British Prime Minister David Lloyd George opposed harsh reparations, arguing for a smaller sum that was less damaging to the German economy so that Germany could remain a viable economic power and trading partner. He also argued that reparations should include war pensions for disabled veterans and allowances for war widows, which would reserve a larger share of the reparations for the British Empire. Wilson opposed these positions and was adamant that no indemnity should be imposed upon Germany. The Paris Peace Conference opened on 18 January 1919, aiming to establish a lasting peace between the Allied and Central Powers. Demanding compensation from the defeated party was a common feature of peace treaties. However, the financial terms of treaties signed during the peace conference were labelled reparations to distinguish them from punitive settlements usually known as indemnities, which were intended for reconstruction and compensating families who had been bereaved by the war. The opening article of the reparation section of the Treaty of Versailles, Article 231, served as a legal basis for the following articles, which obliged Germany to pay compensation and limited German responsibility to civilian damages. The same article, with the signatory's name changed, was also included in the treaties signed by Germany's allies. In February 1919, Foreign Minister Count Ulrich von Brockdorff-Rantzau informed the Weimar National Assembly that Germany would have to pay reparations for the devastation caused by the war, but would not pay for actual war costs. After the drafting of the Treaty of Versailles on 7 May that year, the German and Allied delegations met and the treaty was handed over to be translated and for a response to be issued. At this meeting Brockdorff-Rantzau stated, "We know the intensity of the hatred which meets us, and we have heard the victors' passionate demand that as the vanquished we shall be made to pay, and as the guilty we shall be punished". However, he proceeded to deny that Germany was solely responsible for the war. Article 231 of the Treaty of Versailles was not correctly translated. Instead of stating "... Germany accepts responsibility of Germany and her allies causing all the loss and damage ...", the German Government's ion reads, "Germany admits it, that Germany and her allies, as authors of the war, are responsible for all losses and damages ...". This resulted in a prevailing belief of humiliation among Germans; the article was seen as an injustice and there was a view that Germany had signed "away her honor". Despite the public outrage, German government officials were aware "that Germany's position on this matter was not nearly so favorable as the imperial government had led the German public to believe during the war". Politicians seeking international sympathy would continue to use the article for its propaganda value, persuading many who had not read the treaties that the article implied full war guilt. German revisionist historians who later tried to ignore the validity of the clause found a ready audience among revisionist writers in France, Britain, and the US. The objective of both the politicians and historians was to prove that Germany was not solely guilty for causing the war; if that guilt could be disproved the legal requirement to pay reparations would disappear. The Treaty of Versailles stated that a Reparation Commission would be established in 1921. This commission would consider the resources available to Germany and her capacity to pay, provide the German Government with an opportunity to be heard on the subject, and decide on the final reparation figure that Germany would be required to pay. In the interim, Germany was required to pay an equivalent of 20 billion gold marks (US$5 billion) in gold, commodities, ships, securities, or other forms. The money would be used to pay Allied occupation costs and to buy food and raw materials for Germany. Article 121 of the Treaty of Neuilly acknowledged that "the resources of Bulgaria are not sufficient to enable her to make complete reparation". Therefore, the treaty required Bulgaria to pay a sum equivalent of 2.250 billion Gold francs in reparations. The treaties of Saint-Germain-en-Laye, Trianon, and Sèvres acknowledged that Austria, Hungary, and Turkey did not have the resources to pay reparations, and delayed the establishment of a final figure until the Reparation Commission was established. In addition, Bulgaria was required to hand over thousands of livestock to Greece, Romania, and the Serb-Croat-Slovene State "in restitution for animals taken away by Bulgaria during the war". This would not be cred towards the reparation figure. Likewise, Bulgaria had to dispatch 50,000 tons of coal a year to the Serb-Croat-Slovene State in restitution for destroyed mines. These shipments would not be cred against Bulgaria's reparation sum. Germany, Austria, and Hungary all had commitments to handover timber, ore, and livestock to the Allied Powers. They would, however, be cred for these goods. In January 1921, the Allied Powers grew impatient and established the reparation sum at 226 billion gold marks. The Germans countered with an offer of 30 billion. On 24 April 1921, the German Government wrote to the American Government expressing "her readiness to acknowledge for reparation purposes a total liability of 50 billion gold marks", but was also prepared "to pay the equivalent of this sum in annuities adapted to her economic capacity totalling 200 billion gold marks". In addition, the German Government stated that "to accelerate the redemption of the balance" and "to combat misery and hatred created by the war", Germany was willing to provide the resources needed and "to undertake herself the rebuilding of townships, villages, and hamlets". The London Schedule of Payments of 5 May 1921 established "the full liability of all the Central Powers combined, not just Germany alone," at 132 billion gold marks. This sum was a compromise promoted by Belgium—against higher figures demanded by the French and Italians and the lower figure the British supported—that "represented an assessment of the lowest amount that public opinion ... would tolerate". This figure was divided into three series of bonds: "A" and "B" Bonds together had a nominal value of 50 billion gold marks (US$12.5 billion)—less than the sum Germany had previously offered to pay. "C" Bonds, comprising the remainder of the reparation figure, "were deliberately designed to be chimerical." They were "a political bargaining chip" that served the domestic policies of France and the United Kingdom. The figure was completely unreal; its primary function was to mislead public opinion "into believing that the 132-billion-mark figure was being maintained". Furthermore, "Allied experts knew that Germany could not pay 132 billion marks and that the other Central Powers could pay little. Thus, the A and B Bonds, which were genuine, represented the actual Allied assessment of German capacity to pay." Taking into account the sum already paid between 1919 and 1921, Germany's immediate obligation was 41 billion gold marks. To pay towards this sum, Germany could pay in kind or in cash. Commodities paid in kind included coal, timber, chemical dyes, pharmaceuticals, livestock, agricultural machines, construction materials, and factory machinery. The gold value of these would be deducted from what Germany was required to pay. Germany's assistance with the restoration of the university library of Louvain, which was destroyed by the Germans on 25 August 1914, was also cred towards the sum, as were some of the territorial changes the treaty imposed upon Germany. The payment schedule required US$250 million within twenty-five days and then US$500 million annually, plus 26 per cent of the value of German exports. The German Government was to issue bonds at five per cent interest and set up a sinking fund of one per cent to support the payment of reparations. Between the signing of the Treaty of Neuilly-sur-Seine and April 1922, Bulgaria paid 173 million gold francs in reparations. In 1923, the Bulgarian reparation sum was revised downwards to 550 million gold francs, "plus a lump sum payment of 25 million francs for occupation costs". Towards this figure, Bulgaria paid 41 million gold francs between 1925 and 1929. In 1932, the Bulgarian reparation obligation was abandoned following the Lausanne Conference. Because Austria was "so impoverished" after the war, and because of the collapse of the Bank of Vienna, the country paid no reparations "beyond crs for transferred property". Likewise, Hungary paid no reparations beyond coal deliveries because of the collapse of the Hungarian economy. Turkish reparations had been "sharply limited in view of the magnitude of Turkish territorial losses". However, the Treaty of Sèvres was never ratified. When the Treaty of Lausanne was signed in 1923, Turkish reparations were "eliminated altogether". From the initiation of reparations, German coal deliveries were below the level agreed. In an attempt to rectify this situation, the Spa Conference was held in July 1920. At this conference it was decided that Germany would be paid five marks per coal ton delivered to facilitate coal shipments and help feed the miners. Despite this, Germany continued to default on her obligations. By late 1922, the German defaults on payments had grown so serious and regular that a crisis engulfed the Reparations Commission. French and Belgian delegates urged the seizure of the Ruhr to encourage the Germans to make more effort to pay, while the British supported postponing payments to facilitate the financial reconstruction of Germany. On 26 December 1922, Germany defaulted on timber deliveries. The timber quota was based upon a German proposal and the default was massive. [Note 1] The Allies were unanimous that the default was in bad faith. In January 1923, despite quota reductions, the German Government defaulted on coal deliveries for the 34th time in three years following the loss of the Upper Silesian coal fields containing 11 per cent of German coal resources, which had been transferred to Poland. On 9 January 1923, the Reparation Commission declared Germany to be in default of her coal deliveries and voted to occupy the Ruhr to enforce the country's reparation commitments. Britain was the lone dissenting voice to both measures. On 11 January, French and Belgian soldiers—supported by engineers including an Italian contingent—entered the region, initiating the Occupation of the Ruhr. Judging others by themselves, the English, who are blinded by their loyalty, have always thought that the Germans did not abide by their pledges inscribed in the Versailles Treaty because they had not frankly agreed to them ... We, on the contrary, believe that if Germany, far from making the slightest effort to carry out the treaty of peace, has always tried to escape her obligations, it is because until now she has not been convinced of her defeat ... We are also certain that Germany, as a nation, resigns herself to keep her pledged word only under the impact of necessity. The occupation proved marginally profitable; the occupying powers received 900 million gold marks, and much of this merely covered the military costs of occupation. However, the real issue behind the occupation was not German defaults on coal and timber deliveries, but the forcing of Germany "to acknowledge her defeat in World War I and to accept the Versailles Treaty". Poincaré recognized that if Germany could get away with defying Versailles in regard to the reparations, a precedent would be created and inevitably the Germans would proceed to dismantle the rest of the Versailles treaty. Although the French succeeded in their objective during the Ruhr occupation, the Germans had wrecked their economy by funding passive resistance and brought about hyperinflation. Under Anglo-American pressure and simultaneous decline in the value of the franc, France was increasingly isolated and her diplomatic position was weakened. In October 1923, a committee consisting of American, Belgian, British, French, German, and Italian experts and chaired by the former Director of the US Bureau of the Budget Charles G. Dawes was formed to consider "from a purely technical standpoint" how to balance the German budget, stabilize the economy and set an achievable level of reparations. In April 1924, the Dawes Plan was accepted and it replaced the London schedule of payment. While the "C" Bonds were omitted from the plan's framework, they were not formally rescinded. French troops were to withdraw from the Ruhr, a bank independent of the German Government with a ruling body at least 50 per cent non-German was to be established, and the German currency was to be stabilized. The payment of reparations was also reorganized. In the first year following the implementation of the plan, Germany would have to pay 1 billion marks. This figure would rise to 2.5 billion marks per year by the fifth year of the plan. A Reparations Agency was established with Allied representatives to organize the payment of reparations. Furthermore, a loan of 800 million marks was to be raised—over 50 per cent coming from the United States, 25 per cent from Britain, and the balance from other European nations—to back the German currency and to aid in the payment of reparations. Under the Dawes Plan, Germany always met her obligations. However, they considered the plan a temporary measure and expected a revised plan at a future date. In late 1927, the Agent-General for Reparations "called for a more permanent scheme" for payments and in 1928 the Germans followed suit. German Foreign Minister Gustav Stresemann called for a final reparation plan to be established alongside an early withdrawal of Allied troops from the Rhineland. The French, aware of their weakening political and financial position, acquiesced. On 16 September 1928, a joint Entente-German statement acknowledging the need for a new reparation plan was issued. In February 1929, a new committee was formed to re-examine reparations. It was chaired by the American banker Owen D. Young and presented its findings in June 1929. The "Young Plan" was accepted and was ratified by the German Government on 12 March 1930. The plan established a theoretical final reparation figure at 112 billion gold marks (US$26.35 billion), with a new payment schedule that would see reparations completed by 1988—the first time a final date had been set. In addition, foreign oversight of German finances was to end with the withdrawal of the Reparations Agency, which would be replaced by the Bank for International Settlements. The bank was established to provide cooperation among central banks and to receive and disburse reparation payments. A further loan of US$300 million was to be raised and given to Germany. As a result of the plan, German payments were half the sum required under the Dawes Plan. The implementation of the Young Plan required the Anglo-French withdrawal from the Rhineland within months. Despite the reduction, there was increasing German hostility to the plan. In December 1929, 5.8 million voters registered their opposition to the plan during a plebiscite, which resulted in Adolf Hitler gaining "significant national attention and valuable right-wing financing". In March 1930, the German Government collapsed and was replaced by a new coalition led by Chancellor Heinrich Brüning. In June, Allied troops withdrew from near Mainz—the last occupation zone in the Rhineland—and Brüning's Government broached the subject of demanding further refinement to reparations, but this demand was refused by William Tyrrell, the British ambassador to France. During 1931, a financial crisis began in Germany. In May, Cranstalt—the largest bank in Austria—collapsed, sparking a banking crisis in Germany and Austria. In response, Brüning announced that Germany was suspending reparation payments. This resulted in a massive withdrawal of domestic and foreign funds from German banks. By mid-July, all German banks had closed. Until this point, France's policy had been to provide Germany with financial support to help Brüning's Government stabilize the country. Brüning, now under considerable political pressure from the far-right and President Paul von Hindenburg, was unable to make any concessions or reverse policy. As a result, Brüning was unable to borrow money from foreign or domestic sources. Further attempts to enlist British support to end reparations failed; the British said it was a joint issue with France and the United States. In early July, Brüning announced "his intention to seek the outright revision of the Young Plan". In light of the crisis and with the prospect of Germany being unable to repay her debts, United States President Herbert Hoover intervened. In June, Hoover publicly proposed a one-year moratorium to reparation and war debts. By July, the "Hoover Moratorium" had been accepted. The moratorium was widely supported in both Germany and the United Kingdom. The French, initially hesitant, eventually agreed to support the American proposal. However, on 13 July, the German Darmstädter Bank collapsed, leading to further bankruptcies and a rise in unemployment further exacerbating Germany's financial crisis. With the Great Depression now exerting its influence, the Bank for International Settlements reported that the Young Plan was unrealistic in light of the economic crisis and urged the world governments to reach a new settlement on the various debts they owed each other. During January 1932, Brüning said he would seek the complete cancellation of reparations. His position was supported by the British and Italians, and opposed by the French. Because of the political differences between countries on the subject and impending elections in France and Germany, a conference could not be established until June. This delay brought about the downfall of Brüning's Government. On 16 June, the Lausanne Conference opened. However, discussions were complicated by the ongoing World Disarmament Conference. At the latter conference, the US informed the British and French that they would not be allowed to default on their war debts. In turn, they recommended that war debts be tied into German reparation payments, to which the Germans objected. On 9 July, an agreement was reached and signed. The Lausanne Conference annulled the Young Plan and required Germany to pay a final, single installment of 3 billion marks, saving France from political humiliation and ending Germany's obligation to pay reparations. The precise figure Germany paid is a matter of dispute. The German Government estimated it had paid the equivalent of 67.8 billion gold marks in reparations. The German figure included—other than gold or goods in kind—the scuttling of the German fleet at Scapa Flow, state property lost in lands ceded to other countries, and the loss of colonial territories. The Reparation Commission and the Bank for International Settlements state that 20.598 billion gold marks was paid by Germany in reparations, of which 7.595 billion was paid before the implementation of the London Schedule of Payments. Niall Ferguson provides a slightly lower figure. He estimates that Germany paid no more than 19 billion gold marks. Ferguson further estimates that this sum amounted to 2.4 per cent of Germany's national income between 1919 and 1932. Stephen Schuker, in his definitive econometric study (1988, pp. 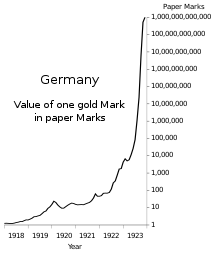 106–19), concedes that Germany transferred 16.8 billion marks over the whole period, but points out that this sum was vastly offset by the devaluation of Allied paper-mark deposits up to 1923, and by loans that Germany subsequently repudiated after 1924. The net capital transfer into Germany amounted to 17.75 billion marks, or 2.1% of Germany's entire national income over the period 1919–1931. In effect, therefore, America paid reparations to Germany—four times more, in price-adjusted terms, than the U.S. furnished to West Germany under the post-1948 Marshall Plan. According to Gerhard Weinberg, reparations were paid, towns were rebuilt, orchards replanted, mines reopened and pensions paid. However, the burden of repairs was shifted away from the German economy and onto the damaged economies of the war's victors. To help make reparations payments, Germany took out various loans during the 1920s. In 1933, following the cancellation of reparations, the new German Chancellor Adolf Hitler cancelled all payments. In June 1953, an agreement was reached on this existing debt with West Germany. Germany agreed to repay 50 per cent of the loan amounts that had been defaulted on in the 1920s, but deferred some of the debt until West and East Germany were unified. In 1995, following reunification, Germany began making the final payments towards the loans. A final installment of US$94 million was made on 3 October 2010, settling German loan debts in regard to reparations. During the period of reparations, Germany received between 27 and 38 billion marks in loans. By 1931, German foreign debt stood at 21.514 billion marks; the main sources of aid were the United States, Britain, the Netherlands, and Switzerland. According to Detlev Peukert, the financial problems that arose in the early 1920s were a result of post-war loans and the way Germany funded her war effort, and were not the fault of reparations. During World War I, Germany did not raise taxes or create new ones to pay for war-time expenses. Rather, loans were taken out, placing Germany in an economically precarious position as more money entered circulation, destroying the link between paper money and the gold reserve that had been maintained before the war. With its defeat, Germany could not impose reparations and pay off her war debts now, which were now colossal. Niall Ferguson partially supports this analysis. He says that had reparations not been imposed, Germany would still have had significant problems caused by the need to pay war debts and the demands of voters for more social services. Ferguson also says that these problems were aggravated by a trade deficit and a weak exchange rate for the mark during 1920. Afterwards, as the value of the mark rose, inflation became a problem. None of these, he says, were the result of reparations. Ferguson says that even without reparations, total public spending in Germany between 1920 and 1923 was 33 per cent of total net national product. A.J.P. Taylor says, "Germany was a net gainer by the financial transactions of the nineteen-twenties: she borrowed far more from private American investors ... than she paid in reparations". P.M.H. Bell says the creation of a multi-national committee, which resulted in the Dawes Plan, was done to consider ways the German budget could be balanced, the currency stabilized, and the German economy fixed to ease reparation payments. Max Winkler says that from 1924 onward, German officials were "virtually flooded with loan offers by foreigners". Overall, he says, the German economy performed reasonably well until the foreign investments funding the economy and the loans funding reparations payments were suddenly withdrawn after the 1929 Stock Market Crash. This collapse was magnified by the volume of loans provided to German companies by US lenders. Even the reduced payments of the Dawes Plan were mainly financed through a large volume of international loans. While Germany initially had a trade deficit, British policy during the early 1920s was to reintegrate Germany into European trade as soon as possible. Likewise, France attempted to secure trade deals with Germany. During the mid-to-late 1920s, trade between France and Germany grew rapidly. French imports of German goods "increased by 60 per cent", highlighting the close links between French industrial growth and German production, and the increase in cooperation between the countries. Max Hantke and Mark Spoerer provide a different perspective on the effect of reparations on the German economy. They say that focusing on the reparations and inflation ignores "the fact that the restriction of the German military to 115,000 men relieved the German central budget considerably". Hantke and Spoerer also say that their findings show "that even under quite rigorous assumptions the net economic burden of the Treaty of Versailles was much less heavy than has been hitherto thought, in particular if we confine our perspective to the Reich's budget". They say, "though politically a humiliation", the limitation on the military "was beneficial in fiscal terms" and that their economic models show that "the restriction of the size of the army was clearly beneficial for the Reich budget". Additionally, their economic scenarios indicate that while the Treaty of Versailles was "overall clearly a burden on the German economy", it "also offered a substantial peace dividend for Weimar's non-revanchist budget politicians." They conclude that, "The fact that [these politicians] did not make sufficient use of this imposed gift supports the hypothesis that the Weimar Republic suffered from home-made political failure". Erik Goldstein wrote that in 1921, the payment of reparations caused a crisis and that the occupation of the Ruhr had a disastrous effect on the German economy, resulting in the German Government printing more money as the currency collapsed. Hyperinflation began and printing presses worked overtime to print Reichsbank notes; by November 1923 one US dollar was worth 4,200,000,000,000 marks. Ferguson writes that the policy of the Economics Minister Robert Schmidt led Germany to avoid economic collapse from 1919 to 1920, but that reparations accounted for most of Germany's deficit in 1921 and 1922 and that reparations were the cause of the hyperinflation. Several historians counter the argument that reparations caused the inflation and collapse of the mark. Gerhard Weinberg writes that Germany refused to pay by, and that doing so destroyed their own currency. Anthony Lentin agrees and writes that inflation was "a consequence of the war rather than of the peace" and that hyperinflation was a result of the "German government's reckless issue of paper money" during the Allied occupation of the Ruhr. British and French experts believed that the Mark was being sabotaged to avoid budgetary and currency reform and to evade reparations. Sally Marks writes that the Germans claimed that reparations destroyed the Mark. Marks writes that historians who say reparations caused hyperinflation have overlooked "that the inflation long predated reparations" and the way "inflation mushroomed" between mid-1921 and the end of 1922 "when Germany was actually paying very little in reparations" and have failed to explain why "the period of least inflation coincided with the period of largest reparation payments ... or why Germans claimed after 1930 that reparations were causing deflation". She writes "there is no doubt that British and French suspicions late in 1922 were sound". Marks also writes that the "astronomic inflation which ensued was a result of German policy", whereby the government paid for passive resistance in the Ruhr "from an empty exchequer" and paid off its domestic and war debts with worthless marks. Bell agrees and writes that "inflation had little direct connection with reparation payments themselves, but a great deal to do with the way the German government chose to subsidize industry and to pay the costs of passive resistance to the occupation [of the Ruhr] by extravagant use of the printing press". Bell also writes that hyperinflation was not an inevitable consequence of the Treaty of Versailles, but was among the actual results. 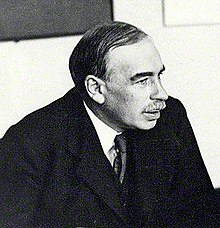 According to historian Claude Campbell, John Maynard Keynes "set the fashion for critics of the economic aspects of the treaty" and "made probably the severest and most sweeping indictment of its economic provisions". Keynes was temporarily attached to the British Treasury during the war and was their official representative at the peace conference. He later resigned "when it became evident that hope could no longer be entertained of substantial modifications in the draft Terms of Peace" due to the "policy of the Conference towards the economic problems of Europe". In 1919, he wrote The Economic Consequences of the Peace based on his objections. He wrote that he believed "that the campaign for securing out of Germany the general costs of the war was one of the most serious acts of political unwisdom for which our statesmen have ever been responsible", and called the treaty a "Carthaginian peace" that would economically affect all of Europe. Keynes said that the treaty's reparation figures "generally exceed Germany's capacity" to pay. He said that US$10 billion was the "safe maximum figure", but even then he did "not believe that [Germany could] pay as much". He said the Reparation Commission was a tool that could "be employed to destroy Germany's commercial and economic organization as well as to exact payment". In Keynes' opinion, the reparation figure should have been fixed "well within Germany's capacity to pay" so to "make possible the renewal of hope and enterprise within her territory" and to "avoid the perpetual friction and opportunity of improper pressure arising out of the Treaty clauses". Keynes identified reparations as the "main excursion into the economic field" by the Treaty of Versailles, but said that the treaty excluded provisions for rehabilitating Europe's economies, for improving relations between the Allies and the defeated Central Powers, for stabilizing Europe's new nations, for "reclaim[ing] Russia", or for promoting economic solidarity between the Allies. Coal provides an example of these destabilizing effects in Germany and beyond. Keynes said the "surrender of the coal will destroy German industry" but conceding that without coal shipments as reparations, the French and Italian industries damaged directly by the war or indirectly by damage to coal mines would be affected. He writes that this is "not yet the whole problem". The repercussions would also affect Central and Northern Europe, and neutral states such as Switzerland and Sweden, which made up for their own coal deficiencies by trading with Germany. Likewise, Keynes said Austria would now be consigned to "industrial ruin" as "nearly all the coalfields of the former Empire lie outside of what is now German-Austria". Campbell writes that the "apparent majority did not regard the treaty as perfect". Bernard Baruch writes in The Making of the Reparation and Economic Sections of the Treaty that most believed it to be the best agreement obtainable under the circumstances and that it was a minority that attacked the treaty, but these attacks "centered upon its economic provisions". James T. Shotwell, writing in What Germany Forgot, said, "the only 'unendurable servitudes' in the treaty were in the sections on Reparation and the Polish settlement and raised the question as to what part of Germany's grievance against the peace lay in the substance of its exactions and what part in the manner of their imposition". Sir Andrew McFayden, who also represented the British Treasury at the peace conference and later worked with the Reparation Commission, published his work Don't Do it Again. McFayden's position "falls somewhere between the views of Keynes and Shotwell". His attack on reparations "was as harsh as Keynes" but he conceded that the "fault did not lie primarily in the provisions of the treaty but in their execution". He also believed "that he Polish settlement was the only readjustment ... which was decidedly unwise". Albrecht-Carrié writes that before the German surrender, Woodrow Wilson dispatched a note to the German Government on 5 November 1918 stating that the Allies "under-stand that compensation will be made by Germany for all damage done to the civilian population of the Allies and their property by the aggression of Germany by land, by sea, and from the air", the terms of which they accepted. Regardless of which, Albrecht-Carrié says the reparation section of the treaty proved "to be a dismal failure". Campbell says, "although there was much in the peace that was 'petty, unjust, and humiliating', there was little aside from reparation clauses and certain territorial concessions, which had much real bearing upon Germany's economic future". Summarizing the view of economists throughout the 1920s, she says the territorial changes to Germany were "not necessarily ... economically unsound", but than the removal of the Saar and territory to Poland "depriv[ed] Germany of her resources in excess of the amount necessary to fulfill the legitimate economic demands of the victors ... [and] was indefensible". Campbell also said the treaty failed to include "provisions looking to the restoration of Germany to her former position as the chief economic and financial stabilizing influence in central Europe" and that this was economically shortsighted and was an economic failing of the treaty. Étienne Mantoux, a French economist, was the harshest contemporaneous critic of Keynes. In his posthumously published book, The Carthaginian Peace, or the Economic Consequences of Mr. Keynes, Mantoux said that Keynes "had been wrong on various counts, especially with respect to his predictions about Germany's coal, iron and steel production ... and its level of national saving". Keynes said Europe's overall output of iron would decrease; Mantoux said the opposite occurred. By 1929, European iron output had increased by ten per cent from that of 1913. Keynes believed that this European trend would also affect German iron and steel production. Mantoux says this prediction was also incorrect. By 1927, German steel output had increased by 30 per cent and iron output increased by 38 per cent from 1913. Keynes predicted that German coal extraction would also decrease and that Germany would not be able to export coal immediately after the war. Mantoux also counters these arguments. By 1920, German was exporting 15 million tons of coal a year and reached 35 million tons by 1926. By 1929, German coal mining had risen by 30 per cent on the 1913 figures because of her increased labor efficiency methods. In regard to national savings, Keynes stated that 2 billion marks would only be possible after the adoption of the treaty. Mantoux says that the 1925 German national savings figure was estimated at 6.4 billion marks, rising to 7.6 billion marks by 1927. Mantoux calculated that Germany borrowed between 8 billion and 35 billion marks in the period 1920–1931, while only paying 21 billion in reparations. This, he says, allowed Germany to re-equip, expand, and modernize her industry. Highlighting the rearmament under Hitler, Mantoux said Germany "had been in a stronger position to pay reparations than Keynes had made out". He also says that Germany could have paid all of the reparations if she had wanted to, and that the problem was not that Germany was unable to pay, but that she was unwilling to pay. In 1954, United States Secretary of State John Foster Dulles—one of the authors of Article 231—said that, "Efforts to bankrupt and humiliate a nation merely incite a people of vigor and of courage to break the bonds imposed upon them ... Prohibitions thus incite the very acts that are prohibited." Geoff Harcourt writes that Keynes' arguments that reparations would lead to German economic collapse have been adopted "by historians of almost all political persuasions" and have influenced the way historians and the public "see the unfolding events in Germany and the decades between Versailles and the outbreak of the Second World War". He says Mantoux's work "is not simply a critique of Keynes", but "a stimulus to question the received wisdom's interpretation of the unfolding events in Germany". Harcourt says that despite it discussing Keynes' errors "in great detail", Mantoux's work "has not led us to revise our general judgment of Keynes", yet "it does make us question the soundness of theoretical and empirical aspects" of his arguments. A.J.P. Taylor writes that in 1919 "many people believed that the payment of reparations would reduce Germany to a state of Asiatic poverty", and that Keynes "held this view, as did all Germans; and probably many Frenchmen". However, he also says these "apprehensions of Keynes and the Germans were grotesquely exaggerated". According to Martel, Taylor "shrewdly concludes that Étienne Mantoux had the better of his controversy with John Maynard Keynes". Stephen Schuker writes that Keynes' "tendentious but influential" book was "ably refuted" by Mantoux. Richard J. Evans says "the economic history of the 1920s and early 1930s seemed to confirm" the arguments of Keynes, yet "as we now know" Keynes' reparation arguments were wrong. Evans says the economic problems that arose were a result of the inflation of 1923, which lay with the German government rather than reparations. According to Slavieck, the "traditional interpretation of the treaty's impact on Germany" was that it "plunged the nation into an economic free fall". This view was shared by the German people, who believed the treaty was robbing Germany of its wealth. German banker Max Warburg said the terms of the treaty were "pillage on a global scale". Niall Ferguson says the German view was incorrect and "not many historians would today agree with Warburg". However, several historians agree with Warburg. Norman Davies writes that the treaty forced Germany to "pay astronomic reparations", while Tim McNeese states, "France and Britain had placed war damages on Germany to the tune of billions of gold marks, which the defeated Germans could not begin to pay in earnest". Ferguson says the reparations were "less of a burden than Keynes and others claimed" and that the "potential burden on national income of the annuity vary from 5 percent to 10 percent". However, he cautions against underestimating the initial German effort to pay. Before the implementation of the Dawes Plan, Germany transferred between eight and 13 billion gold marks, which amounted to "between 4 and 7 percent of total national income". Ferguson says "the annuity demanded in 1921 put an intolerable strain on the state's finances" and that total expenditure between 1920 and 1923 amounted to "at least 50 percent of Reich revenue, 20 percent of total Reich spending and 10 percent of total public spending". Thus, Ferguson says, reparations "undermined confidence in the Reich's crworthiness" and "were therefore excessive—as the German government claimed". Hantke and Spoerer write that "reparation payments were indeed a severe economic burden for Germany" and that "the German economy was deprived of between one and 2.2 billion Reichsmark (RM) annually, which amounted in the late 1920s to nearly 2.5 per cent of Germany's GDP". Gerald Feldman writes, "there can be no question that the entire London schedule could be viewed as a way of reducing the reparations bill without the Allied publics being fully informed of what was going on. This was recognized by at least some German politicians, one of whom optimistically argued that 'the entente will only demand the 50 billion marks, not the rest. They have only called for the rest for domestic political reasons.'" Feldman also says the prospect that the 'C' bonds would be evoked hung over the German Government like a "Damocles Sword". In addition to Feldman and Ferguson's opposition, Peter Kruger, Barry Eichengreen, and Steven Webb agree that "the initial German effort to pay reparations" was substantial and "produced an immense strain" on the German economy. Several historians take the middle ground between condemning reparations and supporting the argument that they were not a complete burden upon Germany. Detlev Peukert states, "Reparations did not, in fact, bleed the German economy" as had been feared, however the "psychological effects of reparations were extremely serious, as was the strain that the vicious circle of crs and reparations placed the international financial system". P.M.H. Bell writes that while reparations were unwelcome in Germany and caused a "strain on the German balance of payments", they could be paid and were "compatible with a general recovery in European commerce and industry". According to Martel, Robert Boyce said reparations were "a heavy burden on Germany, both as a financial charge ... and as a charge on Germany's balance of payments". However, he says that while "Germany claimed it could not afford to pay reparations" this was far from the truth, and that " ... Germany had made little effort to pay reparations. It refused to levy the necessary taxes, and far from accumulating the foreign exchange required for their payment by collecting some of the overseas earnings of German exporters, it allowed them to leave their earnings abroad". William R. Keylor agrees with Boyce, and says, "an increase in taxation and reduction in consumption in the Weimar Republic would have yielded the requisite export surplus to generate the foreign exchange needed to service the reparation debt". However, Charles Feinstein writes that these kind of arguments overlook the extreme reluctance of the Germans "to accept even a modest increase in taxation to meet what was universally regarded as an unjustified and oppressive imposition by hostile adversaries". Feinstein says that "even if the economic aspects ... were not as crippling as had been assumed in the 1920s, the exaction of reparations was still of deep political and psychological significance for Germany". Sally Marks writes, "There are those ... who claim reparations were unpayable. In financial terms, that is untrue ... Of course Germans did not want to pay; nobody ever wants to pay, and Weimar was determined not to do so ... Raising taxes would have provided ample funds ... Weimar could have borrowed from the citizenry, as France did after 1871 [to pay its indemnity to Germany]". Marks writes that Germany could have easily paid the 50 billion marks in reparations, but instead chose to repeatedly default on payments as part of a political strategy of undermining Versailles. Marks says that in 1921, Germany met her requirements in full because custom posts were occupied by Allied troops. Once the Allies had relinquished control of the customs posts, Germany made no further payments in cash until 1924 following the implementation of the Dawes Plan. Marks says that while Article 231 of the Treaty of Versailles "established an unlimited theoretical liability", Article 232 limited German responsibility to pay only for civilian damages. When the 1921 London conference to determine how much Germany should pay was called, the Allies calculated on the basis of what Germany could pay, not on their own needs. In this way, Marks says, the Germans largely escaped paying for the war and instead shifted the costs onto American investors. Marks states that the delay in establishing a final total until 1921, "was actually in Germany's interest" because the figures discussed at the peace conference were "astronomic". She says, "The British experts, Lords Sumner and Cunliffe, were so unrealistic that they were nicknamed 'the heavenly twins'." Marks also says, "much ink has been wasted on the fact that civilian damages were stretched to cover war widows' pensions and allowances for military dependents". As reparations were based on what Germany could pay, Marks says the inclusion of such items did not affect German liability but altered distribution of reparations; the "inclusion of pensions and allowances increased the British share of the pie but did not enlarge the pie." Bernadotte Schmitt writes that if "pensions and separation allowances ... not been included, reparations would probably never have become the bogey that poisoned the post-war world for so many years. Taylor says, "no doubt the impoverishment of Germany was caused by war, not by reparations. Not doubt the Germans could have paid reparations, if they had regarded them as an obligation of honour, honestly incurred." However, he says, "reparations ... kept the passions of war alive". Peter Liberman writes that while the Germans believed they could not meet such demands of them, the "French believed that Germany could pay and only lacked the requisite will" to do so. Liberman says this is "a position that has gained support from recent historical research". In regard to Germany's capacity to pay, he focuses on coal and says that German coal consumption per capita was higher than France's despite coal shipments being consistently short. He also says, "the reparations demanded at Versailles were not far out of proportion to German economic potential" and that in terms of national income it was similar to what the Germans demanded of France following the Franco-Prussian War. Martin Kitchen also says the impression that Germany was crippled by the reparations is a myth. Rather than a weakened Germany, he states the opposite was true. Keylor says that literature on reparations has "long suffered from gross misrepresentation, exaggeration, and outright falsification" and that it "should finally succumb to the archive-based discoveries of scholars". Diane Kunz, summarizing the historiography on the subject, writes that historians have refuted the myth that reparations placed an intolerable burden on Germany. Marks says a "substantial degree of scholarly consensus now suggests that paying ... was within Germany's financial capacity". 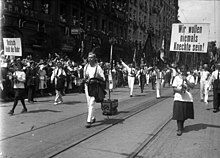 Ruth Henig writes, "most historians of the Paris peace conference now take the view that, in economic terms, the treaty was not unduly harsh on Germany and that, while obligations and damages were inevitably much stressed in the debates at Paris to satisfy electors reading the daily newspapers, the intention was quietly to give Germany substantial help towards paying her bills, and to meet many of the German objections by amendments to the way the reparations schedule was in practice carried out". ^ By the 1922 quota deadline, "France had received 29% of her sawn timber allotment and 29% of her share of telegraph poles." While the German default was aimed specifically at France, there "was also substantial default on timber deliveries to Belgium and Italy". In addition, Britain "was still awaiting 99.80" per cent of her 1922 timber deliveries. ^ a b No figure currently found showing the exact mark to dollar conversion. Instead, the estimated dollar value has been presented based on Sally Marks' comment that while the "paper mark depreciated rapidly, the gold mark held at 4 to the dollar and 20 to the pound." ^ Henig 1995, p. 63. ^ Simkins, Jukes & Hickey 2003, p. 9. ^ Tucker & Roberts 2005, p. 429. ^ Beller 2007, pp. 182–95. ^ Simkins 2002, p. 71. ^ Tucker & Roberts 2005, p. 638. ^ Schmitt 1960, p. 101. ^ Slavicek 2010, pp. 41–43, 58. ^ MacMillan 2003, p. 202. ^ a b Weinberg 1994, p. 14. ^ Slavicek 2010, p. 44. ^ Brezina 2006, p. 21. ^ Yearwood 2009, p. 127. ^ Martel 2010, p. 272. ^ Slavicek 2010, p. 37. ^ Bell 1997, p. 22. ^ Marks 1978, p. 231. ^ a b Marks 1978, pp. 231–32. ^ Young 2006, pp. 133–35. ^ Young 2006, pp. 135–36. ^ Binkley & Mahr 1926, pp. 399–400. ^ Morrow 2005, p. 290. ^ Binkley & Mahr 1926, p. 400. ^ Boemeke, Feldman & Glaser 1998, pp. 537–38. ^ Bell 1997, p. 21. ^ a b Albrecht-Carrié 1940, p. 15. ^ a b c Martel 2010, p. 156. ^ Boemeke, Feldman & Glaser 1998, p. 410. ^ United States Department of State 1921, p. 46. ^ United States Department of State 1921, p. 47. ^ a b c d e f g Marks 1978, p. 237. ^ a b Marks 1978, p. 236. ^ Crafts & Fearon 2013, p. 113. ^ Marks 1978, pp. 223–34. ^ World Peace Foundation 1922, p. 18. ^ a b c d Marks 1978, pp. 234–35. ^ Crampton 1987, p. 84. ^ Taylor 2001, p. 59. ^ Taylor 2001, p. 60. ^ Marks 1978, pp. 235–36. ^ Marks 1978, pp. 239–40. ^ a b Marks 1978, p. 240. ^ Marks 1978, p. 241. ^ Hehn 2005, p. 66. ^ Marks 1978, p. 243. ^ Bell 1997, pp. 24–25. ^ Marks 1978, p. 244. ^ Martel 1999, p. 26. ^ Schwarzschild 1942, p. 140. ^ a b c d Marks 1978, p. 245. ^ Marks 1978, p. 246. ^ a b Bell 1997, pp. 37–38. ^ Crafts & Fearon 2013, pp. 82, 114. ^ Marks 1978, pp. 249–50. ^ a b Backhaus 2012, p. 70. ^ a b Bell 1997, p. 38. ^ Marks 1978, pp. 250–51. ^ a b Young 2006, p. 171. ^ Marks 1978, pp. 251–52. ^ Shamir 1989, p. 25. ^ Marks 1978, p. 251. ^ Young 2006, pp. 171–72. ^ Young 2006, p. 174. ^ Shamir 1989, pp. 56–58. ^ Crafts & Fearon 2013, p. 155. ^ Albrecht-Carrié 1960, p. 200. ^ Harsch 2009, p. 160. ^ Temin & Toniolo 2008, p. 137. ^ Temin & Toniolo 2008, pp. 137–38. ^ Mommsen & Foster 1988, p. 454. ^ Joshi 2005, p. 78. ^ a b Grenville & Wasserstein 2000, p. 140. ^ Kindleberger 1986, p. 19. ^ a b c Marks 1978, p. 233. ^ a b c d e Boemeke, Feldman & Glaser 1998, p. 424. ^ Schuker 1988, p. 11. ^ Martel 1999, p. 43. ^ a b Weinberg 1994, p. 16. ^ Suddath, Claire (4 October 2010). "Why Did World War I Just End?". Time. Retrieved 29 July 2014. ^ United States Department of State 1921, pp. 46–48. ^ Martel 1999, p. 35. ^ Boemeke, Feldman & Glaser 1998, p. 417. ^ a b Henig 1995, p. 62. ^ Tooze 2007, p. 7. ^ a b Peukert 1993, p. 62. ^ a b Boemeke, Feldman & Glaser 1998, pp. 420–21. ^ Boemeke, Feldman & Glaser 1998, p. 413. ^ a b c Taylor 1991, p. 44. ^ Bell 1997, p. 37. ^ Winkler 1933, pp. 86–87. ^ a b Martel 1999, p. 24. ^ Bell 1997, pp. 38–39. ^ a b Hantke & Spoerer 2010, p. 849. ^ Hantke & Spoerer 2010, p. 851. ^ Hantke & Spoerer 2010, p. 860. ^ Hantke & Spoerer 2010, p. 861. ^ Boemeke, Feldman & Glaser 1998, pp. 409–10, 425. ^ Lentin 2012, p. 26. ^ Marks 1978, p. 239. ^ Bell 1997, p. 25. ^ Campbell 1942, p. 161. ^ Keynes 1920, p. 146. ^ Keynes 1920, pp. 86–87. ^ Keynes 1920, p. 215. ^ Keynes 1920, p. 200. ^ Keynes 1920, p. 79. ^ Keynes 1920, p. 265. ^ Keynes 1920, p. 226. ^ Keynes 1920, pp. 94–95. ^ Campbell 1942, p. 160. ^ Campbell 1942, pp. 161–62. ^ Albrecht-Carrié 1940, p. 16. ^ Campbell 1942, p. 162. ^ Campbell 1942, p. 163. ^ a b Cord 2013, p. 41. ^ Mantoux 1952, pp. 162–63. ^ Taylor 1991, p. 70. ^ Immerman 1998, p. 10. ^ Harcourt 2012, p. 21. ^ Martel 1999, p. 42. ^ Schuker 1988, p. 7. ^ Evans 2008, Hitler and the Origins of the War. ^ Slavicek 2010, p. 95. ^ Boemeke, Feldman & Glaser 1998, p. 401. ^ Davies 2007, p. 133. ^ McNeese 2010, p. 19. ^ Boemeke, Feldman & Glaser 1998, p. 425. ^ Boemeke, Feldman & Glaser 1998, p. 426. ^ Feldman 1997, p. 339. ^ Feldman 1997, p. 430. ^ Boemeke, Feldman & Glaser 1998, p. 445-6. ^ Peukert 1993, p. 197. ^ Martel 2010, p. 183. ^ Boemeke, Feldman & Glaser 1998, p. 502. ^ Feinstein 1995, p. 32. ^ Marks 2013, pp. 632–59. ^ Marks 1978, p. 255. ^ Marks 1978, p. 238. ^ a b Marks 1978, p. 232. ^ Marks 1978, p. 254. ^ Schmitt 1960, p. 107. ^ Liberman 1995, p. 89. ^ Kitchen 2006, p. 67. ^ Keylor 2013, The Demonization of Versailles. ^ Boemeke, Feldman & Glaser 1998, p. 524. ^ Boemeke, Feldman & Glaser 1998, p. 357. ^ Henig 1995, p. 65. Binkley, Robert C.; Mahr, Dr. A. C. (June 1926). "A New Interpretation of the "Responsibility" Clause in the Versailles Treaty". Current History. 24 (3): 398–400. Evans, Richard (2008). "Hitler and the origins of the war, 1919–1939". Gresham College. Retrieved 27 April 2014. McNeese, Tim (2010). Jensen, Richard, ed. World War II 1939–1945. Discovering U.S. History. Chelsea House Publications; 1 ion. ISBN 978-160413-358-5. Martel, Gordon, ed. (2010). A Companion to Europe 1900–1945. Wiley-Blackwell; 1 ion. ISBN 978-1-4443-3840-9.